To be fair, the story that we’re currently looking at may have the best plot twist in a Dark Shadows story that we’ve ever seen. 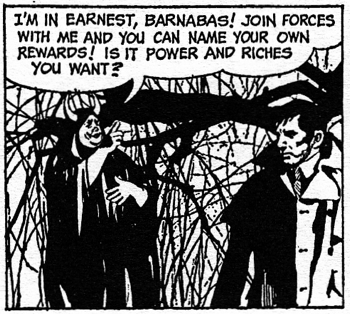 Mr. Sinestra wants Barnabas to join his evil cult, and his way of making that happen is to strip the straight-edge vampire of all his benevolent-cousin cred. Transforming into a Barnabas lookalike, Sinestra spent the afternoon with Elizabeth and Carolyn, and then set up a scenario where it looked like he committed a murder, right in front of his horrified family. He had his minion, Keech, steal a letter opener from the front hall of Collinwood, and then Sinestra, as “Barnabas”, chased the thief up to the cliffs at Widow’s Hill. “Barnabas” retrieved the letter opener, and then callously threw Keech off the cliff to die on the rocks below. 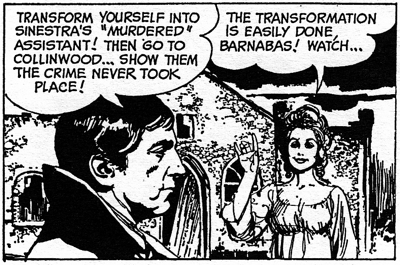 When the real Barnabas showed up in the evening, he found that everyone thought he’d murdered a man. It’s a simple and devastatingly effective plot, the most coherent master plan that we’ve ever seen. Naturally, that means that things are about to go seriously haywire. 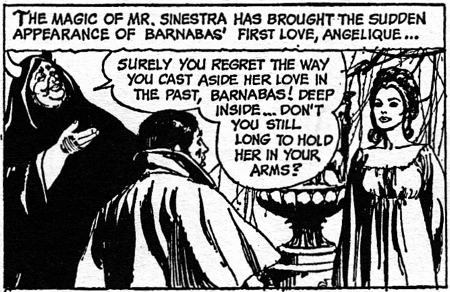 It starts with the return of “Barnabas’ first love, Angelique”. Understandably, the comic strip has untangled the show’s complex soap opera storylines, distilling things down to the minimum viable product so that readers who’ve never seen the show can understand what’s going on in the strip. 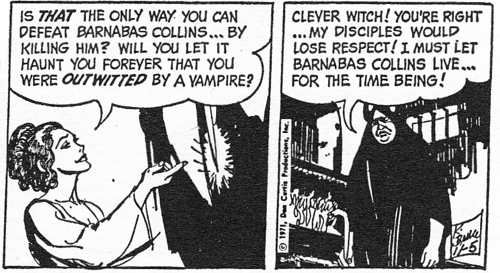 In this version of Dark Shadows (which is already kind of For Dummies) For Dummies, Barnabas loved the beautiful witch Angelique, and then spurned her for some vague reason that may involve trying to enroll him in Mr. Sinestra’s underground cave cult. Anyway, he spurned her is the point, and she turned him into a vampire, and that’s the whole thing — a spoonful of backstory, designed for easy consumption. So Sinestra sets up a nightmare dream date for the unhappy pair, dangling her in front of Barnabas, and then dismissing her with a snap of the fingers. Then he says, think it over, my friend, mwa ha haaa, we’re not so different, you and I, no Mr. Bond, I expect you to die, thank you for calling Comcast customer service. But Angelique comes back, because why not. “I couldn’t stay away, Barnabas!” she declares. “Because I want to help you… even though I know you can never love me as I love you!” That’s the end of the tension between them; it’s all wrapped up in two panels, and then they just hang out for a while. It’s actually a nice moment, silly as it is. If you think about it too hard, it falls apart — is she under Sinestra’s control, or not? — but for once in this daffy strip, Barnabas has somebody familiar to talk to. He’s mislaid all of his actual friends in the transition from screen to newspaper — Julia and Quentin and Willie and Stokes, who all show up in the Gold Key comic books but have apparently evaporated here — so he ends up making weird temporary alliances with whoever comes along, befriending dead ancestors and hapless librarians. Here, Barnabas and Angelique meet as equals, former lovers with a problem to solve. 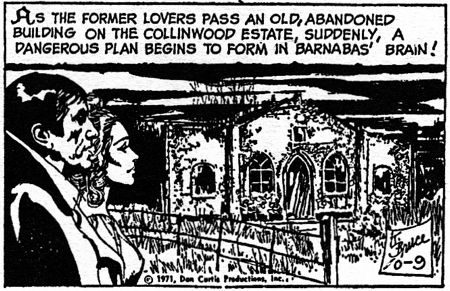 Suddenly, as they stroll by an old building, a dangerous plan begins to form in Barnabas’ dangerous brain. He tells Angelique to magically disguise herself as Keech, the guy that he’s supposed to have murdered, and convince Elizabeth and Carolyn that he wasn’t murdered after all. This impossible scheme is a runaway success, because comic strip Elizabeth and Carolyn really aren’t very bright. The problem with creating an airtight trap for Barnabas in this strip is that they have to walk it back a week later, and if it’s a really strong setup — as it is, here — then the only way to resolve the problem is to just kick it to pieces. “Keech” tells Elizabeth and Carolyn that Barnabas didn’t push him off the cliff deliberately — he just slipped off, and managed to land on a ledge a little ways down. 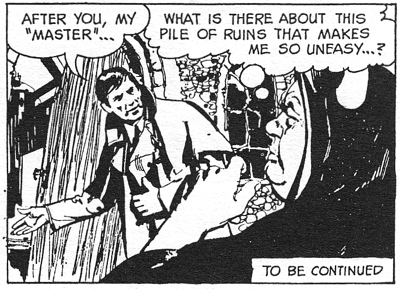 This isn’t actually an explanation for anything, especially the callous things that “Barnabas” said after the murder, but I suppose everybody’s tired of this plot point, and they just want to move on, better luck next time. There’s still three weeks left in the story, so what else can we do to disappoint the audience? 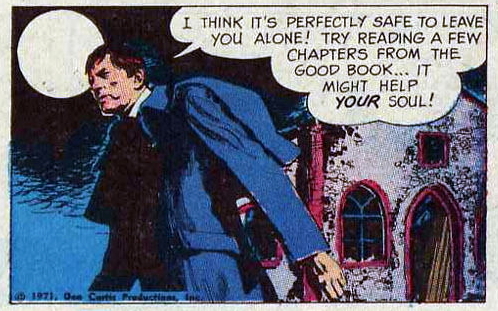 Well, let’s start with Mr. Sinestra threatening to kill Angelique, unless Barnabas joins his gang. This is apparently a credible threat, so why he didn’t start with this, I don’t know. Barnabas agrees to sign Sinestra’s contract, and leads him into an old building on the estate so they can take care of business. The evil cult leader gets a weird tingle when he enters the building, and then it turns out to be the Collins family chapel! And this is a huge problem for some reason! This is what happens when you write stories about Evil with a capital E.
Mr. Sinestra doesn’t have any specific goals except to be Evil, whatever that means, and to ensnare Barnabas’ soul, whatever that means. These are abstract philosophical concepts that are difficult to explore within the context of a three-panel daily adventure story, so all you can do is to say, this weird wizard is Evil, and if you want to fight Evil (which is a thing you can fight), then you have to use Good (which is a thing you can use). It’s bananas, a new world record for a story spinning out of control and crashing into a tree. People always talk about Barnabas being a “reluctant vampire” or a “moral vampire” — which he’s not, thank goodness, and saying that means that you’ve missed the point of Dark Shadows, and this scene is exactly why. Dark Shadows is a narrative entirely powered by surprise, where the creators show the audience the craziest thing they can think of, and then challenge themselves to come up with something to top it. The idea that Barnabas is Good, or a Hero, is antithetical to that approach. “Good vs Evil” is a straitjacket, which makes the story more predictable. If you follow that path, then it inevitably leads to a scene like this. Don’t get me wrong, I love this moment. It makes me incredibly happy, just for the sheer wrongness of it. It’s an incredible surprise. But like everything that’s worthwhile in the world of Dark Shadows, it’s the kind of trick that can only work once. And in this story, we don’t just get Good Barnabas — we also get Good Angelique, which is simply insupportable. This is not how Dark Shadows is supposed to behave. To make up for this, they’re going to have to come up with something screwy and incomprehensible for the next story, and fortunately for us, that is precisely what they do. Tomorrow: The Ballad of Big Boy. Is there anything more ominous in the history of Dark Shadows than this one sentence?